Five Elite Guard face off against the TMNT, Karai and her Foot Soldiers. Seizing the opportunity to confuse and deceive, the disguised Karai screams at the Elite. One of the Elite falls for the trick and commits ritual suicide, but the others are not so easily deceived and demand to see “Shredder’s” face. Karai removes the helmet and throws it at the Guard. The Elite are taken aback and the Turtles use their pause to launch an attack. Casey arrives at his mother’s apartment building with his baby. “Sure! Moving back in, are you?” Mrs’ Jones asks. “So…who do we have here? Oh what a cutie-pie!” Mrs. Jones beams. “That’s Shadow… my… um… daughter.” announces Casey. “Is she yours?” Casey’s mom asks. The Turtles and the Elite are battling furiously. Foot Soldiers are armed with submachine guns and firing at will, but most of them are being killed by the Guard. April is seated at a restaurant. She’s circled an item on the Real Estate page. The old man is peering out of the window of the hospital. He walks away from it, needing no assistance, and sits on the bed. Leonardo takes out one of the Elite, but another has cornered Karai. 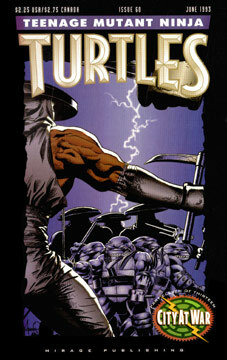 Raph has his hands full with one of the Guard who’s utilizing a chain, but the Turtle defeats his opponent. Karai leaps onto a lighting fixture to escape her foe, but it pulls out of the ceiling and sends her careening to floor – the Elite dives after her but is slain when Karai uses a lamp post to impale him. Outside on the roof, Donatello is searching for his quarry. The Elite sneaks up on the Turtle and kicks him to the floor, breaks his leg and then kicks the injured terrapin off of the roof! Karai has her hands full as another Elite attacks her.